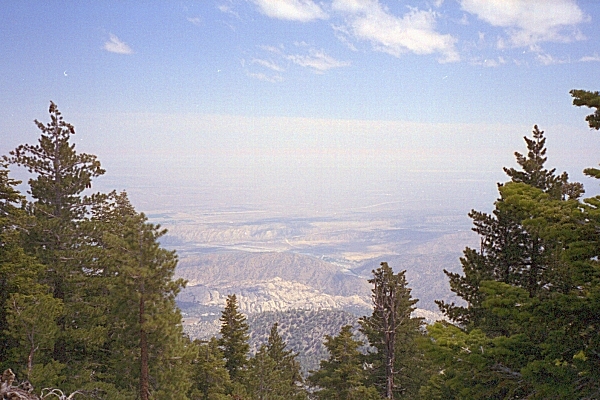 In the spring of 1999 I had to lay over in Los Angeles for a day, so I took the opportunity to do some exploring in the San Gabriel mountains just north of the city. 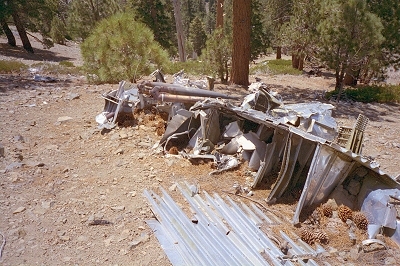 I had visited Mt Williamson in 1979, and had unexpectedly found the remains of airplane wreckage. I wanted to revisit the site, partly to see if I could find it again, and partly to see how much had changed in twenty years. The week previous had been warm and sunny in LA. I had been staying on Eastern time by getting up at dawn and running up to Rolling Hills High School from Del Amo. But the day of the hike it was foggy and cool. As I drove towards the mountains, it only got darker and wetter. Finally it started to rain. This is the one thing I had not counted on. I had plenty of water, but no rain gear. I drove on despite the deteriorating weather, because I had no better idea of what to do next. After almost an hour of alternating rain and thick fog, I suddenly emerged into bright sunlight. I took a look around, and saw sunny, clear weather above, and nothing but clouds below. There was Mt. Williamson just ahead. What a fortunate choice ! 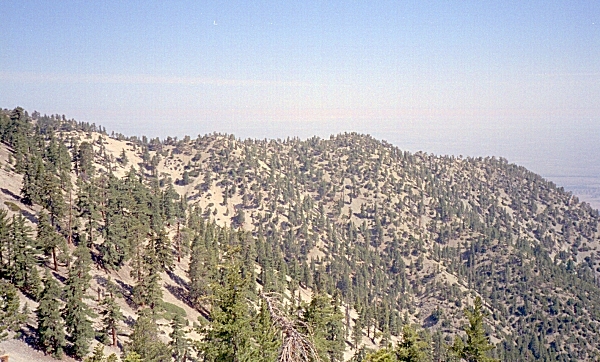 Los Angeles Basin from Angeles Crest Highway near Mt. Williamson. I got started on the wrong trail. Instead of heading for the peak, I inadvertently headed toward a rock climbing area nearby. It took me an hour of scouting around before I figured out that I had parked at the wrong trailhead. In the meantime, I had stumbled on some interesting ruins, such as this abandoned cabin. 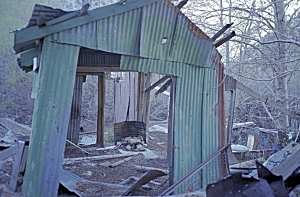 Cabin Ruins near trailhead to Williamson Rocks. The (correct) trail to Mt. 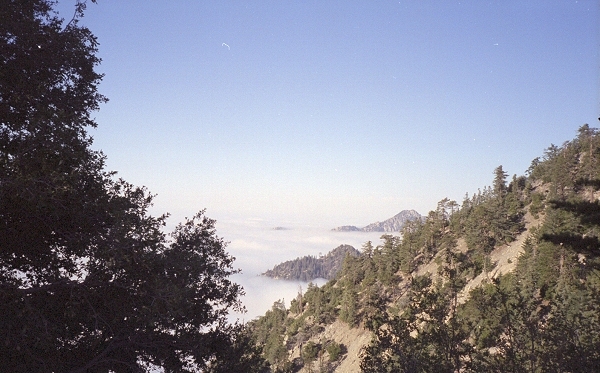 Williamson starts near a high point of the Angeles Crest Highway, and goes up from there. After only a short way, the views are breathtaking. Clouds covered the lower foothills and the entire LA basin, but to the north, the Mojave desert was sunny and clear. Mojave Desert from Mt. Williamson. Devil's Punchbowl is the white band of rock in the center. I will skip most of the details of the hike. 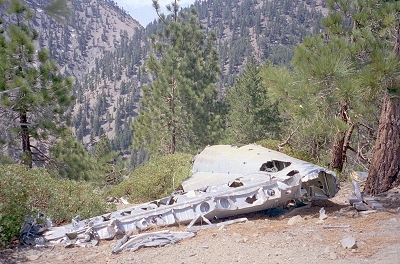 From the peak of Mt Williamson, the remains of the airplane are clearly visible, if you know what to look for. The picture below was taken from Mt. Williamson, and shows the ridge to the north. 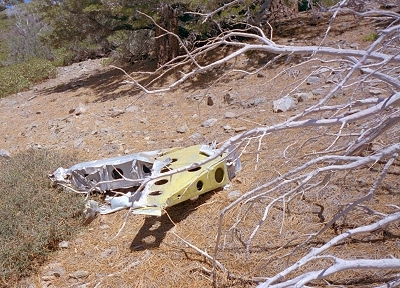 The airplane wreck is in the center of the image, but is not really visible in the photo. It is quite clear in person, because the sun reflects off the shiny metal in a way unlike anything else. You can try to contour across the mountainside, but I found it was easier to stick to the ridges, even though that is more up and down. Once you reach the wreck site, you cannot miss it. I did not find the large wing section that had been so prominent before, but the tail section, shown below, was exactly as I had remembered it. 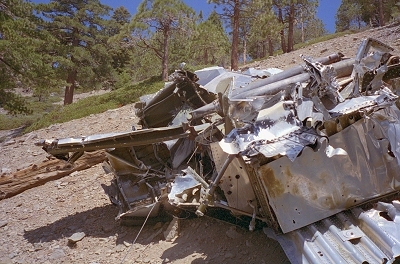 The crash occurred only a few yards below the crest of the ridge. 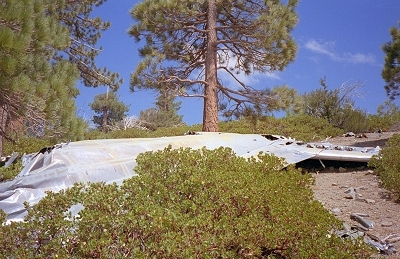 This shows the tail section, and how close they came to making it over the ridge. I had more time to explore on this trip, so I climbed down the steep slope. 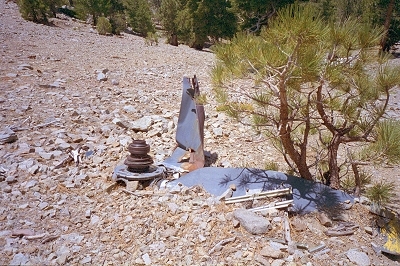 There were numerous scraps of metal, rubber, and other debris all down the side of the mountain. Junk came in many sizes: lots of pieces were the size of a saucer or a dinner plate, but a few were sizeable. This time I had plenty of time to explore the whole crash site, and fully satisfied my curiosity. I did not find the wing, leading me to believe someone either moved it or removed it entirely. I saw a far greater diversity of parts than before. I remembered lots of aluminum pieces, but this time I found all sorts of pipes, wiring, mechanical fixtures, and other assorted hardware. On my return, I made a panorama shot from Mt. Williamson. Drag the mouse over the picture to pan. Use Shift and Control to zoom.